On this day in 2000, Russian national Dmitry (or Dmitri) Chikunov was secretly put to death* in Tashkent, Uzbekistan for the murder of two men. 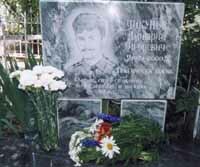 A symbolic grave for Dmitry Chikunov; his actual resting place is unknown. His mother, who had been shooed away from the prison on a previous visit with a demand that she come back later, only learned of the execution when she attempted to visit him two days later. ** She has never learned where he was buried. However, Tamara Chikunova turned out to be the type to turn grief into action. She became a prominent human rights and anti-death penalty activist in Uzbekistan (and globally); her Mothers Against the Death Penalty and Torture organization was troublesome enough that the government blocked one of its conferences in 2003. Well, Gandhi said it — “First they ignore you, then they laugh at you, then they fight you, then you win.” On January 1, 2008, Uzbekistan abolished the death penalty. Tamara Chikunova discusses the rampant official corruption and malfeasance endemic in Uzbekistan’s (former) death penalty, and the issues still ahead for her organization, in this interview. * Dmitry Chikunov’s execution by gunshot took place only nine months after trial; it’s hardly a surprise that Dmitry claimed to have been tortured into confession. ** In this French article, Chikunova says her son was actually shot while she herself was in the prison attempting to visit him.